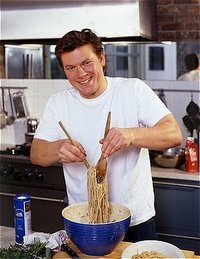 Tyler Florence (born March 3, 1971) is a chef and television star of several Food Network shows. He graduated from the College of Culinary Arts at Johnson & Wales University in Charleston, South Carolina in 1994. He studied under Charlie Palmer, Marta Pulini, and Rick Laakonen. He hosts Food 911, How to Boil Water, and Tyler's Ultimate on the Food Network. He has been widely acclaimed for his abilities by publications such as Food and Wine, GQ, Wall Street Journal, USA Weekend, and People, as well as by other chefs. Tyler has a son, Miles, born in June of 1996.